Good news for Samsung lovers that you can update Samsung Galaxy FIT S5670 to Gingerbread 2.3.4 Firmware. the improved version of leak one and Gingerbread 2.3.4 is the third leak version of Gingerbread. Remember that after updating your device you have to reconfigure the APN settings and all the Internet APN settings have to be reset. For this purpose you have to contact with your service provider to get APN setting and you also have to reconfigure the MMS Settings. And if you don’t know what you are doing then it is better for you to stay away from it. PLEASE BACKUP AL DATA BEFORE UPDATE ! Step 1: Download the Gingerbread 2.3.4 update package for Samsung GALAXY FIT in your computer from here and as soon as you download it you will have to unzip to folder to get the files like Boot, CODE, Modem, CSC along with the Odin Multi uploader. Please note that even if a single file is missing then it means that the files have not been downloaded properly and again you need to download them. Step 2: So, after downloading and in the extraction process if it prompts you to enter the password at any point of time then you will have to enter the password as “ S5670XWKQ2” . 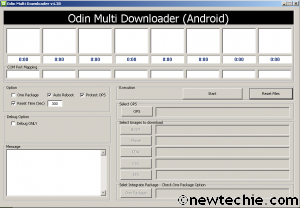 Step 3: After this, just open the “Odin Multi uploader” file from the extracted folder and then you will have to now turn the phone Off as you will have to turn your phone ON in the download mode. Step 4: Please note that the download mode can be entered by holding the Volume Down button + the Home key button (the middle button). While holding these both buttons, you need to switch ON your device. Now, if you have successfully entered into the download mode then you will see a green screen which is shown below. Please note that if the device boots in the normal mode with the home screen then retry the process and if despite retrying you are unable to get into download mode then you will have to fix the download mode error for your phone. Step 6: As soon as you feed in the files, you will have to double check the same and then you will have to proceed and click on the “Start” option to start the firmware update process. After clicking on the start, you will see that the firmware will be installed in your phone within a time of not more than 5 minutes. Step 7: After the Galaxy FIT reboots, you will have see the home screen and then choose the options accordingly and then after you see the home screen and after the completion of Media scanning, you will have to go in the recovery mode wherein you will have to delete the cache memory so that all unwanted files are removed if there are any left in the phone. 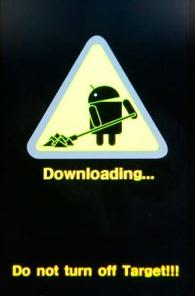 That’s it you have now successfully flashed your phone with the latest Android 2.3.4 update. For checking on which firmware you are currently on, you will have to go to the Settings > About Phone > Firmware Version where you will find the version of Android OS where it will show 2.3.4. 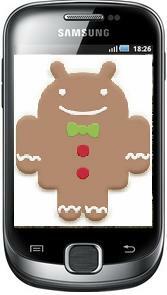 As you can see above that we have shown some of the images of latest Gingerbread update of 2.3.4. So, let us know if you face any sorts of issues as we will see to it that all issues are resolved. Stay tuned with us at Facebook & Twitter and Subscribe Email to get updates on latest Updates on Samsung Galaxy Fit.